As most of the photo hobbyists always want their batteries alive for their photo shoots it's vital that they have extras for those moments when you don't want to be stopped by low battery problem. And as I'm one of those photo hobbyists here's what I found at good deal with Amazon. 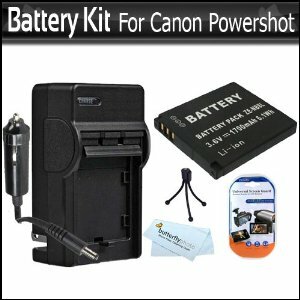 Picture above shows battery and charger kit for Canon Powershot A3300 IS, A2200 IS, A3100 IS, A3000 IS Digital Still Camera. The kit also includes extended (1000 Mah) replacement batter for NB-8L,AC/DC travel charger, screen protectors, mini tabletop tripod and micro fiber cleaning cloth. The kit costs USD14.95 from previous price of USD39.95. Such a nice super deal for Canon accessories with savings of USD25.00.